Automation and robots are vital for production placing highest demands on quality, productivity and efficiency. Also – and especially – in the automotive area, production may be increased by up to 30%. Costs per piece are reduced, horizons for innovative solutions widened and openings created for totally new concepts. Robots spray adhesive and release agent precisely and reproducibly. Using pick & place technology they position inserts, products, equipment, control pouring heads. With over 20 years experience in the field and more than 800 robots delievered, DESMA's experience means we are able to offer the matching automisation solution, adjusted to the customer's individual needs. Whether you need a single robot station or a higly automated production line, a completely new installation or a robot to fit into your current process, DESMA supports you with expertise. We are also happy to provide training for your employees, installation, help and service worldwide. 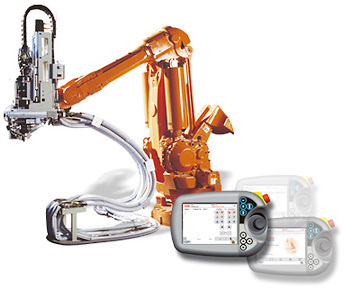 The Graphical Robot Control (GRC) system was developed especially by DESMA to meet the demands of the technical industry. It combines the highest level of user-friendliness with most modern control technology and lowest programming demands, during production without downtime. 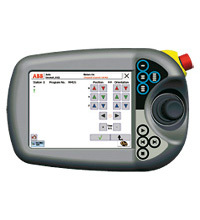 The graphical touchscreen with its logical user symbols and intuitive programming ensures ease of use. There is no need for special programming knowledge on the part of the operator, who is able to master the operation after a short introduction. The programme offers a variety of languages, and only parameters necessary for production are visualised. GRC communicates directly with DEScom®; recipes are quickly transferred. Offline control and offline programming ensure changes and alterations may be made without interrupting production. The new generation offers higher processing speeds, the single axis may be moved more quickly. Data saving is performed automatically and dynamically. Speed is gained by the fact that only the currently necessary data is stored within the robot memory. Other programmes, e.g. roughing programmes may of course be amended without interrupting production. Downtime costs money. So we at DESMA developed DEScom®, our special software for programming DESMA robots. This modular, offline programming system perfectly fulfils the needs of industry, with highest efficiency. DEScom® and GRC are the perfect combination, offering a time-saving alternative to regular teach-in systems: costs are lowered. The programming/simulation combination not only saves programming time but also reduces machine downtime to the minimum. DEScom® helps with new programming or process optimisation which otherwise is time consuming and costly, e.g. modifications of spraying contours or programme administration. Data saving, administration and direct import of CAD data from the mould production are further advantages. This is all provided on a regular PC with Windows user interface and useful extra modules such as grading and mirror functions. DESMA release agent spraying robots for polyurethane processing work with an electrostatic spraying technology. Thus, the release agent is only sprayed exactly where it is needed for perfect de-moulding, in exactly the correct amount. Release agent consumption is minimized, whatever release agent is necessary for your process, whether it is wax or water based. Silicone and paraffin are sprayed evenly. This exact, precise minimal use of release agent ensures that the injected PU does not stick to the mould. De-moulding is straighforward, the product is not damaged. A bonus: the small amount of release agent ensures a longer mould life. Use of adhesive is mostly unavoidable when rubber or thermoplastic material is to be injected onto another polyurethane part. Only thus is effective bonding achieved. Our DESMA adhesive spraying robot applies adhesive evenly and in the correct amount &ndash exactly there, where it is needed. Various spraying nozzles are available. 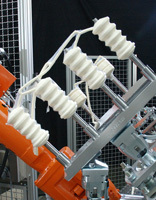 DESMA Pick & Place robots may be used almost universally within all areas of production, e.g. for optimisation of material flow logistics. Above all, they work reproducibly and thus provide highest quality and efficiency. Together we find special solutions, trimmed exactly for your production. 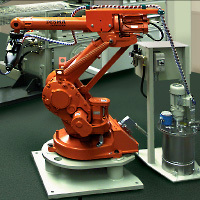 This could be your start in automation: incorporate one or more robots into your production on a rotary table or robot cell. Efficiency, reproducibility and quality are improved – especially in the ace of complicated technical articles; employees relieved from monotonous or heavy work. The environment and your personnel are protected by completely secure production units. Robot cells may be incoporated into countless areas of the production of technical areas. desma tec, plastic products, thermoplastics, vulcanized rubber, reactive, polyurethane machine, pu technology, micro injection, flame retardant, mixing head, PU technology, Polyurethan, polyurethane, PU, PUR, PU gießen, pu casting, pu pouring head, Reaktionsspritzgießen, reaction injection moulding, pu casting parts, pu casting products, Feststoff, solid additives, Blähgraphit, expandable graphite, Flammschutz, flame retardant, Gießroboter, casting robot, Mischkopf, mixing head, Niederdruck, low pressure, Hochdruck, high pressure, Kunststoffmaschine, plastic machine, Hartschaum, rigid foam, Elastomer, elastomer, Weichschaum, softfoam, micro injection, Formica Plast, thermoplast, thermoplastic, Mikrocomposite, microcomposites, Nano composite, nano composites, spritzgießen, injection moulding, Spritzgießmaschine, injection machine, Mikrospritzgießmaschine, micro injection machine, mikrospritzgießen, micro injection moulding, metal injection moulding, powder injection moulding, ceramic injection moulding, Präzisionsspritzen, precision moulding, microsystem 50.